Jeep Wrangler Performance, Engine, Ride, Handling | What Car? Under the bonnet is a choice of two engines: a 197bhp 2.2-litre diesel or a 268bhp 2.0-litre turbocharged petrol, both of which come with a standard eight-speed automatic gearbox. So far, we’ve only driven the diesel. 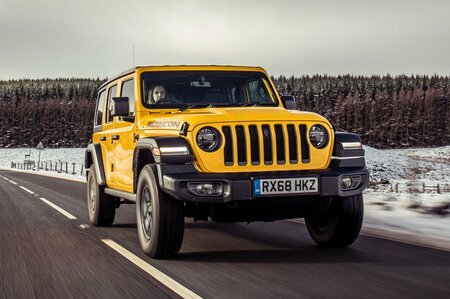 It has a reasonable amount of punch, getting the Wrangler up to motorway speeds without too much fuss, although the much lighter two-door version unsurprisingly feels a lot sprightlier than the four-door model. Thankfully, it's a lot quieter than the previous 2.8-litre diesel, although it still sounds gravelly even while cruising and transmits more than a few vibrations through the controls. This adds to the wind noise generated by the Wrangler’s boxy body – something that’s even more noticeable in canvas-roofed variants. We’ve no real complaints about the auto gearbox, though. Whether you’re creeping up the side of a mountain or trying to overtake on the motorway, it’s almost always in the right gear and shifts smoothly. When transitioning between motorway and mountain, you use the second lever: it takes you from two to four-wheel drive and between the different four-wheel drive modes. It’s a good deal stiffer than the gear lever, but this feels in keeping with the Wrangler’s tough underpinnings. Indeed, unlike the majority of SUVs that you see on the road today, the Wrangler has been designed to take on the very worst that Mother Nature can throw at it. Every model gets low-range gearing, long-travel suspension and vast amounts of ground clearance. But while all of that is brilliant in the rough stuff, it’s a bit of a burden on the road. Turn the steering wheel and there's a noticeable pause before it starts to change direction, and you have to start sawing at the wheel due to the slack deliberately built into the system. Grip levels are fairly modest, especially on the off-road-biased rubber fitted to Rubicon models. These chunky tyres also generate plenty of road roar. 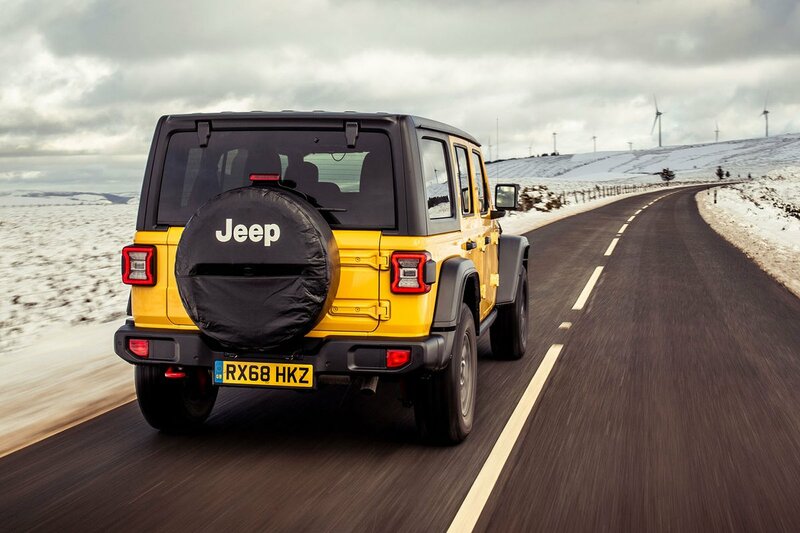 The Wrangler is not a car you’ll want to drive quickly; trust us, we tried and won’t be doing it again. In addition, those big, heavy axles struggle to deal with imperfect surfaces and cause the Wrangler to shimmy over the road. It’s never downright uncomfortable, but it feels a little uncontrolled and you have to make constant steering inputs just to keep the car going in a straight line. 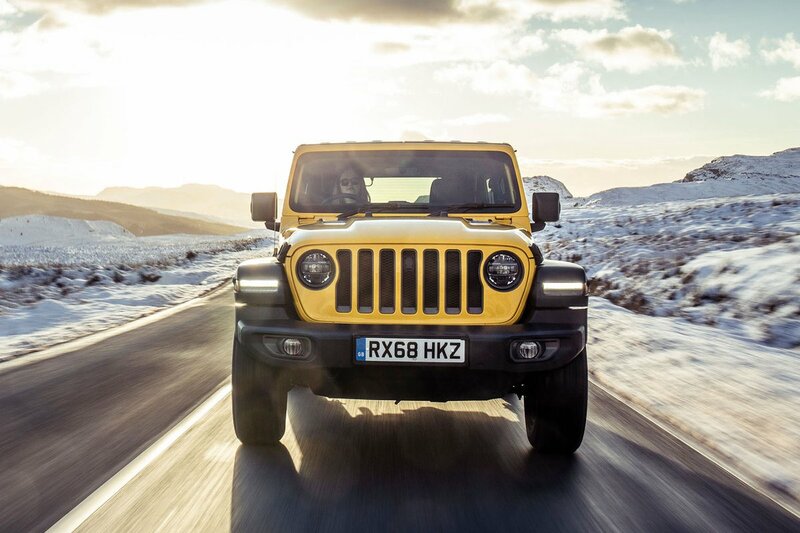 Steer off the blacktop and on to squelchier surfaces and you’ll find the Wrangler far more at home. Once you select four-wheel drive, you can lock the centre differential so the front and rear axles get equal amounts of power at all times, while the low-range gearbox gives you finer control at low speeds and multiplies the engine’s torque for steep slopes. The Rubicon goes even further to maximise its all-terrain potential. As well as chunkier tyres, you get locking front and rear differentials to give even more traction on slippery surfaces, as well as detachable ‘sway bars’ (anti-roll bars to those who speak English) that allow even more suspension travel. Put simply, there are few off-road cars that are quite as capable straight out of the showroom.